Aziz Ansari is one of the biggest stars in stand up comedy today. Having over 11 years of stand up comedy under his belt, Aziz has earned millions of fans across the world. He first burst onto the national scene as a writer and co-creator of MTV’s smash hit Human Giant, a sketch comedy series which ran for multiple seasons. Aziz was then cast in Judd Apatow’s beloved film Funny People, playing opposite Adam Sandler as Randy, a horrible and energetic comedian. Aziz also appeared in 4 episodes of the popular sitcom Scrubs. From 2009-2015 Aziz co-starred as Tom Haverford on NBC’s hit series Parks & Recreation, alongside Amy Poehler, Aubrey Plaza, Nick Offerman, Rob Lowe, and Adam Scott. Aziz served as the host for the 2010 MTV Movie Awards, where he shared the stage with the biggest stars in the world. His comedy special, Intimate Moments from a Sensual Evening, earned rave reviews and widespread acclaim from fans. Aziz’s follow-up Dangerously Delicious tour was released exclusively on his website AzizAnsari.com for $5 per download. Aziz Ansari’s Twitter account also has 7.5 million followers to date, proving his wild popularity in and out of the country. 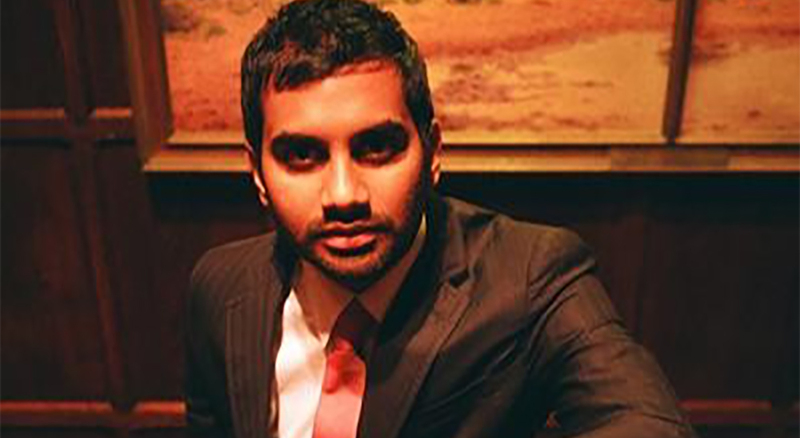 Aziz has performed at the biggest theater venues in the U.S., including the legendary Carnegie Hall.